There are a number of termite repellents available in the market today. For the health conscious homeowner, especially those who have children at home, the primary concern would be the risk the chemical sprays would bring to the young ones. Still, as many home and business owners have learned by now that termites may attack secretly, precautionary measures are needed to ensure that properties are secure from these unfriendly visitors. Considering that termites can build extensive nests beneath your home or inside your walls, and that they can make treatment and prevention a complex project, the best thing left to do is to let trained Gilbert termite control professionals do the job that most would not be comfortable doing in the first place. They grow their colonies slowly but can have hundreds to thousands, with population reaching even up to 500,000 in some colonies. A queen termite can lay around 2,000 to 3,000 eggs pera day, ensuring the survival of colonies that can survive for decades. Note that an effective termite control requires proper identification of the termite species as well as a comprehensive inspection of the site to help determine the full extent of the infestation. Once the termite species and approximate location have been determined, your termite specialist can discuss termite repellents (termiticides) or other methods that may be effective in controlling the infestation and preventing future re-infestation. Professionals likewise have the equipment needed to complete different approaches of termite treatment (i.e fumigation, heat treatment, and soil treatments). While there are common household items as well as garden plants that possess insecticidal and repellent properties, experts claim that there is no effective homemade termite repellent. 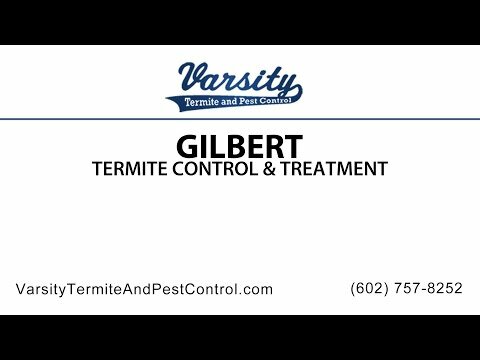 Effective Gilbert termite treatment needs to find its way to the whole colony directly or through products that scavenging termites can share with the rest of the nest. However, homemade products are not formulated to protect properties on possible re-infestation, nor are they made to wipe out the entire termite populating a location. There are a number of natural termite repellents as well as insecticide products. These products are not as effective as other methods, hence do not provide long-term protection for your home or business. Although some of these products may constrain termites that come into close contact with them, these products are not able to control the entire colony. Consulting with termite management professionals can help you better understand the benefits as well as the limitations of all-natural termite control products. In case you think using natural products will do the job, a termite management professional can use his or her expertise on termite behavior when applying all-natural products. Furthermore, they can provide follow-up inspections to determine the degree of effectiveness of the method used. Other system that have been tried to manage termite infestation, are non-chemical methods. Some of these require the application of heat as well as electronic treatments. However, these methods involve specific equipment to control active termites within a locality. Other considerations in conducting a termite management method include the time of day, temperature during which the method is to be applied, the season, as well as the type of environment where the treatment is to be conducted—all these have impacts on termites as well as the methodology used in managing them. Contact us to day! Read the rest of Do These Homemade Fly Repellents Really Work?